You can output the export in a CSV file or a Google Sheet. 1. After installing the Document Export bookmarklet, open a library homepage or a view where you have reader permissions. 2. Press Document Export in your bookmark bar. 3. In the Document Export pop-up, select the scope of the export. – If you run Document Export from a library homepage, the scope of the export is set to All documents in this library by default. 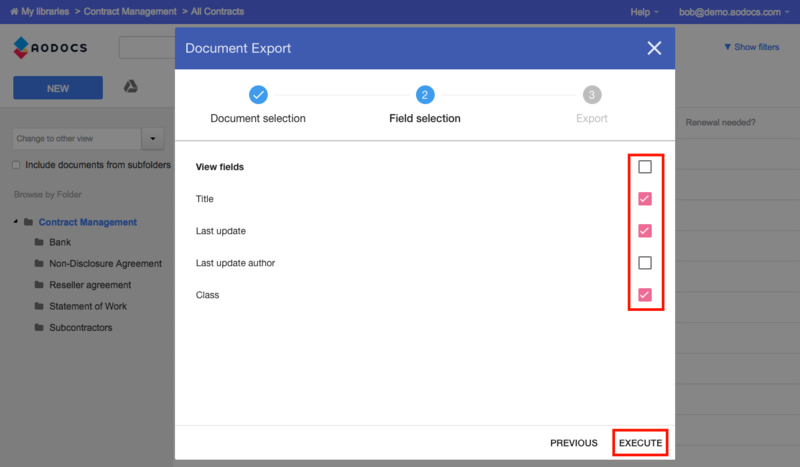 – If you run Document Export from a view, the scope of the export is set to all documents in the current view by default. 4. Select the format of the export: CSV file or spreadsheet. 6. Select the properties to export and press Execute. Depending on the export format you requested, a CSV file is downloaded or a Google Sheet is created and opened in your My Drive. The exported properties are listed in a table where the columns are the name of the properties, and the documents are listed in the rows. – The bookmarklet can export the properties of no more than 1000 documents at a time. If there are more than 1000 documents, the properties from the 1001st to the 2000th are written in a new Google Sheet or CSV file. – Once the export is over, you can return to the first panel to change the settings and run another export. Bookmarklet document export is only export 1000 records and it stops. I have a 1100 library. Is this a limitation ? how can I go around that? If you have more than 1,000 documents, after each exports of 1,000 documents, the “Document Export” pop up asks you to click on “Continue” to run another export of the next 1,000 documents. Tell us if it works for you. I get the Continue after each 1000 documents but at the end it tells me it has reached the end but the CONTINUE button is still disabled so I don't receive my files. If I export less then 1000 it works fine. Can this number be increased to say 10000 which would seem reasonable for a CSV or spreadsheet? Hi Tim, how many documents were you able to export with the AODocs Bookmarklet - Document Export? Hi, Can I export the link to the document in the spreadsheet? 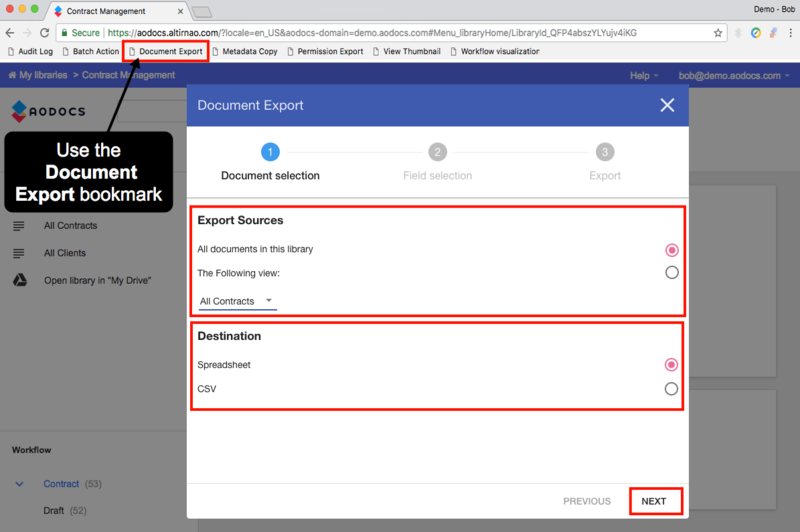 The bookmarklet does not allow you to export the link to the AODocs document or attachments. Can you please add the known limitation of documents volume to be exported? and what would be the best practice in such case? eg. 10k docs in one view to export. Please open a support ticket if this is still an issue for you.